Octopus in Super Smash Bros. for Wii U.
Octopus (オクトパス, Octopus) is Mr. Game & Watch's Final Smash which is based on the Game & Watch game of the same name. In the attack, Mr. G&W transforms into a large octopus, the same color as the Mr. Game & Watch being played. It slowly float-crawls freely through the stage in Super Smash Bros. Brawl and Super Smash Bros. 4, and quickly drags players offscreen in a predefined path in Super Smash Bros. Ultimate. An image of the Octopus Game & Watch. Octopus is a Game & Watch game where three treasure hunting divers avoided a giant octopus guarding a sunken pirate ship and collected its sunken treasure. If one of the divers got caught by the octopus, the next diver would come down and substitute. The octopus would keep watch over the ship until all of the divers were caught. Mr. Game & Watch's up smash also originates from Octopus, where he uses his diver's helmet to headbutt his opponents. 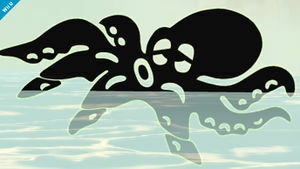 In Ultimate, the octopus drags the opponents to the blast zone, similar to how the octopus would grab ahold of the diver if they ran into a tentacle. The Octopus makes its first appearance in Brawl. Even though the Octopus appears to float, it still requires terrain in order to move, which results in a self-destruct if it falls off the stage, although it can jump and double-jump a small bit. The Octopus has unlimited swim time and is unaffected by the current of moving water in stages such as Jungle Japes. The Octopus is also unaffected by stage hazards such as Klaptraps (on Jungle Japes) and the Fish (on Summit). Out of its eight legs (one of which cannot be seen), four of them can extend to about 7 times their length. Normally, only the body will damage the opponents, but if the tentacles are extended then the tips of the tentacles will damage opponents until they withdraw. The tentacles in the back deal less damage than the ones in the front, which can be a problem since the Octopus can't turn around. Touching the G&W Octopus causes 16% of damage. The Final Smash lasts about 17 seconds. Whilst activated, most of the screen fades slightly (causing the screen to somewhat resemble a Game & Watch's white background) and a strange noise is heard. It is interesting to note that the Octopus is not affected by slow motion effects. Octopus returns as Mr. Game & Watch's Final Smash in Super Smash Bros. 4. It appears to act similarly to its appearance in Brawl, but its damage output has been nerfed. Its appearance is mostly unchanged from Brawl, though the outline has changed color, matching the fluctuating colors of the Smash Ball. Octopus returns again as Mr. Game & Watch's Final Smash in Super Smash Bros. Ultimate, but is no longer a fully controllable transformation. It now works similarly to Ganondorf's Final Smash. Once activated, it will automatically charge towards the direction Mr. Game & Watch was facing, passing through all obstacles. The player can control the Octopus vertically, but cannot affect its horizontal speed at all. Like in previous versions, mashing A or B will cause its tentacles to rapidly extend. Other players being hit by any part of the Octopus' body bar its tentacle will deal 18% and fixed knockback to them. Players touching the tentacles will be caught as the Octopus charges forward, dealing a small amount of damage. They will be KOed if forced outside of the blast zones by the Final Smash. Alternatively, they will be dealt 40% damage and high knockback if the Octopus passes through a wall while they are grabbed. Players can escape from this, however, depending on their current damage, with higher damage making it increasingly difficult to escape. It ends as soon as the Octopus is beyond the blast line, and Mr. Game & Watch is taken back to the location where the Final Smash was activated. While its great speed increase raises its KO potential compared to earlier incarnations, it has reduced range, being limited to a predefined path once it's activated. Octopus trophy in for Wii U. The Game & Watch title Octopus featured a hero collecting treasure while avoiding a bothersome giant octopus's tentacles. Activate Mr. Game & Watch's Final Smash to transform into that octopus! Ram into opponents, and use the attack button to extend the tentacles. The only thing you can't do is change the direction you're facing. Octopus in Super Smash Bros. for Nintendo 3DS. Octopus as shown by a Skill Preview in Ultimate. This page was last edited on April 17, 2019, at 19:10.